I was alone in the office elevator. Then the doors flew open, and in walked our CEO. It was early in my career, and I was new and had never met him—but I recognized him right away. In fact, I'd been hired to write his speeches. So this was quite an opportunity. All I had to do was extend my hand, introduce myself, and tell him I was delighted to have been hired to write for him. I could even have suggested a meeting! And I'm sure he would have agreed—what CEO wouldn't want to get to know his new speechwriter? But of course, I blew it. I didn’t think quickly enough, and all we did was exchange a short nod. In fact, over the next two years, I would never meet him face to face again. Ultimately, I left the company because, well, who wants to write for someone she has no access to? It might've been different if I had just said hello. It's offhand moments like these that offer big opportunities to build relationships with executives who otherwise might be out of reach—especially to young staff or new hires. Chances are you already have a good rapport with your own boss—you work together every day. It's the people higher up who may seem much further away—until you're suddenly stuck with them inside an elevator, the modern office's great equalizer. Here's what to do when that happens. An elevator is a room of sorts. So first, decide whether you have a real opportunity. If there are others in the elevator, it’s probably not the best time to strike up a chat about a big topic with a senior-level exec. It's not that there'd be anything inherently wrong with that, but the situation just might not be right, and it could turn out awkward for both of you. Rightly or wrongly, others may see you as breaking rank or overstepping your boundaries. Or the executive might just be caught off guard and feel embarrassed. So save your elevator conversations for moments when the two of you are riding alone. Even in that one-on-one situation, keep your office-politics antenna out. If your boss’s boss is deep in thought, leave her alone. She may be thinking through her next meeting or hashing out a tricky decision. Make eye contact if you can, and show that you're respectfully aware of her presence and status, but otherwise keep to yourself. Another time will come! If the situation does seem right, speak with substance and avoid trivial exchanges. Don’t waste your chance asking whether she had a nice weekend or what she thinks of the weather. Go for something more substantial—an observation or question that has the subtle power to leave a strong impression and, ultimately, move your career forward. Introduce yourself. If you haven't met the executive before, extend your hand and say, "Hi, I’m Henry Yarmouth, the director of our call center." You might also add something that shows your commitment to the company, as long as it doesn't sound like you're sucking up, like, "I started in August and so far really like it. The people are great." Share a win. Tell the executive about something you or your team have accomplished. A diversity manager told me that she rides the elevator regularly with her CEO, since they both have offices on the 20th floor. Just about every time, she takes the opportunity to highlight how she and her team are helping the business. In a recent elevator ride, she shared with the CEO about how her team won a contract to support new immigrants. Don’t worry about sounding boastful! It's a short ride, so make a quick, positive impact. Your executive will appreciate the good news. Offer your congratulations. You can also congratulate your boss’s boss on an achievement, either his own, his department’s, or the company’s. If you saw him give a talk recently, don't just say you liked it, explain why. If his department received an honor, mention that. If Q4 results were impressive, comment on that. People love to be recognized for success, and if you stay current with this sort of information—as you should—you'll put a glow on the executive’s face. Ask for a meeting. What better elevator topic is there than a request to meet? I know of a director who reported to a VP but was so savvy that he requested meetings with the SVP. And when the VP left, that director was promoted to the VP role. In order for that to happen, of course, the SVP needed to know who he was. So seize your chance in the elevator to say something like, "I’m working on some employee engagement issues, and I’d love to hear your perspective. Any chance I'd be able to steal a half hour of your time?" Who wouldn’t be flattered by such a request? Just make sure you let your own boss know—you don't want to be seen as going over her head. Finally, follow up on whatever conversation you do manage to strike up. You might schedule a quick meeting or write an email that expands on your comments. Or you might share an article that came to mind based on what you discussed. You can even invite that executive to speak to your team. The important thing is to continue building that relationship. Eventually your efforts will reap great returns. And remember: The elevator conversation is far more than a chat inside a moving box of metal. You can apply this advice to all the informal situations where you have a short slice of time to strike up a rapport with senior executives. It might be a chance encounter in a corridor, a coffee room, the kitchenette, or a networking event. But wherever that brief meeting occurs, go for it! Put yourself forward. Those who get noticed, get promoted. Beginning in January 2015, Apple will join Facebook in giving women employees the opportunity to have their eggs frozen - so they can put off motherhood until their careers get fully launched. This is an added perk for some women, and it's a boon for these companies. Indeed, by allowing women to focus on work through much of their childbearing years, this step may help stem the exit of women who choose to leave technology firms when the pressures of child care and work become too great. It will also address gender imbalances in these tech giants. Only 20% of the tech jobs at Apple and 15% at Facebook are now filled by women. And both firms are committed to gender diversity. But what if you don't want to put all your eggs (frozen or otherwise) in this basket? What if you want to have other options for combining work and family? The answer in two words is to "speak up!" You'll help your company by encouraging them to provide other workplace solutions such as better day care, better maternal benefits and more flexible work arrangements. Not only will you gain, but other moms and dads will thank you. In my new book, Taking the Stage: How Women Can Speak Up, Stand Out, and Succeed, I discuss how to be a voice for change in your companies, in your career and in life. 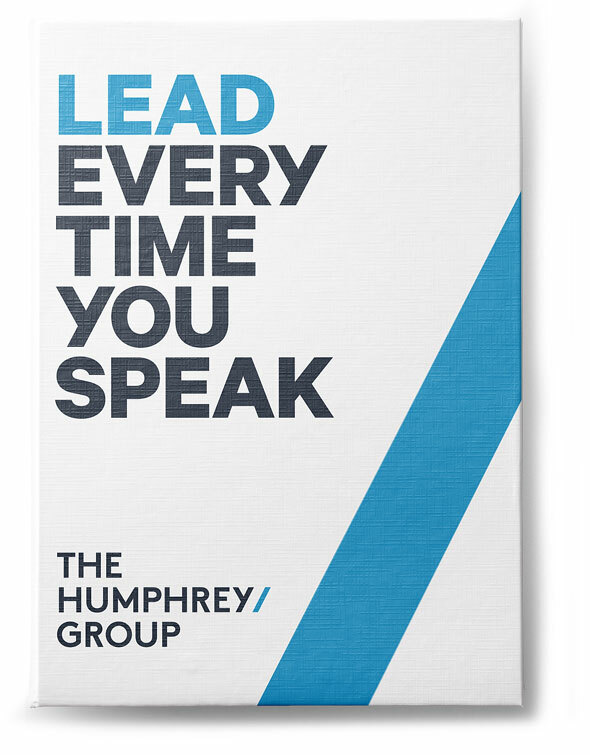 In my 25 years as founder and head of The Humphrey Group, I saw the remarkable results when individuals chose to speak up -- and did so in a strong, thoughtful way. I particularly encourage women to put their hands up and express their views so they can achieve career goals. Here are a set of strategies you can use to have impact on decision making. Courage is critical, because there are so many situations in which we women have to break through barriers, challenge traditional behaviors and redefine the way others see us. A young woman we coached questioned her company's commitment to diversity when she saw that senior management were all white males. She was surprised, but the men in the C-suite welcomed her views, which she expressed thoughtfully and persuasively. It began a process of change and led to her promotion. This sort of courage is especially needed for conversations about motherhood and your career. No one can advocate your case better than you can. Taking the stage involves finding the right people to talk to. Make an appointment with a key decision maker, talk to HR or put yourself on the agenda of the appropriate committee. Or simply open up the conversation with your boss and get her buy-in. It's fine to tweet and blog about these issues -- and companies are growing more aware of what's said on social media -- but discussing your particular proposal with the right people in your company is still the best way to get results. The best, most inspiring presenters speak with vision. You can too! So when you speak up, share that larger view with your co-workers and your boss. If your goals seem to be in-line with your company's stated policies, emphasize that common vision -- and show what needs to be done to make it a reality. Encourage companies that announce themselves as "family friendly" and "supportive of women" to take the key steps to realize those goals. Prepare exactly what you're going to say. Make your message clear and then explain with proof points how your idea will benefit the firm (and the women within it). Never go into the meeting with unsubstantiated or random thoughts. Do a "dry-run" with your husband, partner, or peers -- even if you're planning an informal conversation. That practice will allow you to fine-tune your script and delivery and gain valuable feedback from those around you. They, after all, will be affected by the outcome. It's likely that any questions they share with you will be brought up by the decision makers, so plan your responses to those questions as well. As you're presenting, stay grounded. It's easy for women to get angry or emotional when presenting an idea we are deeply committed to -- particularly if others oppose what we're saying. But remain composed and listen to other views expressed. That way, if need be, you can respond to any questions or challenges. It's often easier to stay silent for fear of failing if we speak up. But, consider this: It's in the interest of both female employees and their companies to have women come forward with a range of solutions that work for them. More broadly, speaking up with courage and confidence can become a way of life. Every time you speak up for something you believe, you'll feel more and more comfortable expressing your views and being a voice for change. So, take the stage!